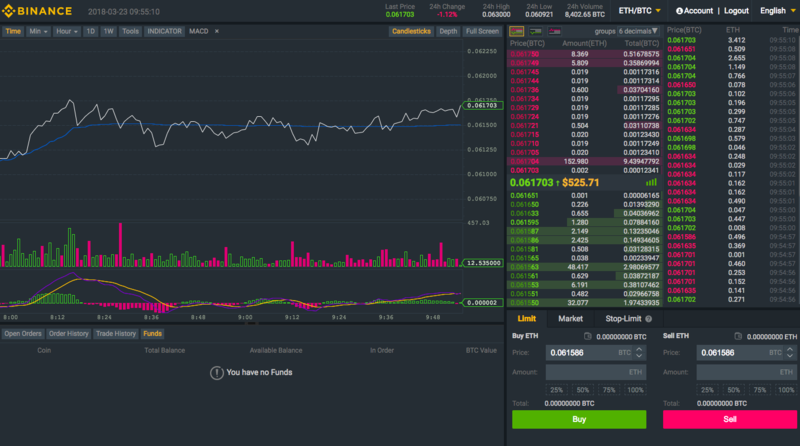 Binance Exchange Review - Should You Use It? Hong Kong- and Tokyo-based Binance is an excellent exchange for seasoned crypto traders looking to move cryptocurrencies at a low cost. It has some of the lowest fees in the industry, while its platform is capable of handling a large volume of trades without suffering a significant slowdown in transaction times. It doesn’t offer fiat currency trades, but it does list over 100 cryptocurrencies, giving customers plenty of choice. The only question mark against its name is its security, since it doesn’t make clear just what measures it takes to keep funds safe and its system secure. First the good news: depositing funds is completely free with Binance. It is, however, a slightly different story with trades and withdrawals, although these still remain among the cheapest in the crypto industry. Binance takes a 0.1% cut of every trade that takes place on its platform, making it one of the cheaper crypto exchanges on the Web. For example, GDAX charge 0.25% for any trade less than 6,792.37 BTC in value, while Bitstamp charge 0.1% only if your trade exceeds USD 20,000,000 in value. Trades can be made even cheaper if the user has a sufficient amount of Binance (BNB) coins. If they do, then Binance will not only take payment from the user’s BNB wallet but will provide a 50% discount on what they take (this reduces to 25%, 12.5%, 6,75% and then 0% in the 2nd, 3rd, 4th and 5th years). In other words, trade fees will be reduced to 0.05%. A prospective custodian (a bank, an asset management company or even a cryptocurrency exchange such as Coinbase) collects the funds from investors and buys shares which are connected to the underlying asset. Parties in charge of purchasing underlying assets for the benefit of the ETF are called authorized participants. In the case of Bitcoin, a custodian will purchase positions in Bitcoin or its futures contracts by spending the investor’s funds. Authorized participants distribute the assets to the ETF providers in exchange for the fund’s shares. The value of these shares is proportional to the value of assets which are received by the ETF providers. Based on this, investors assume the role of shareholders in the fund, without becoming the actual owners of the underlying asset which is being tracked, be it gold or Bitcoin. ETFs should be approved by the regulatory body in charge of the securities’ market prior to being made available on the stock exchanges. Yet, despite the push to get ETFs based on Bitcoin approved in the US and Europe, the regulators have since shot down more than a dozen attempts to approve these. The stated reasons for this have to do with concerns in relation to price manipulations and the security of the underlying cryptocurrency asset. The first rejection took place back in 2013 when the Winklevoss brothers attempted to launch their Bitcoin Trust. Despite this, the optimists hope to see the first Bitcoin ETFs approved in either 2019 or 2020. Once the ETFs get to the exchanges, they can be bought and sold and the decisions made in this regard can bring either profit or losses for the investor. The ETFs also come with the management fees which are covered by decreasing the net asset value (NAV) of the ETF. Since ETFs behave like traded stocks, their price may fluctuate during the trading day based on the existing supply and demand. To put this in some perspective, Kraken and Bittrex both charge a 0.001 BTC withdrawal fee, while Bitfinex and HitBTC charge 0.0008 BTC and 0.00085 BTC respectively. 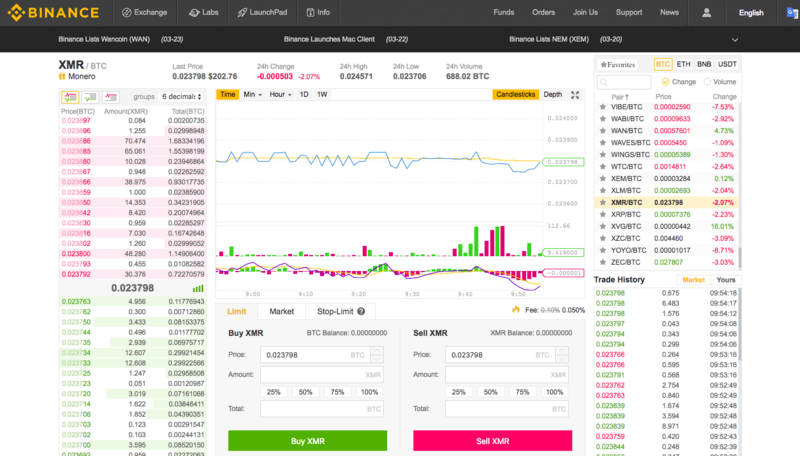 This makes Binance one of the cheapest exchanges out there, with only Poloniex (of the big, well-known exchanges) equalling its BTC withdrawal fee of 0.005 BTC. 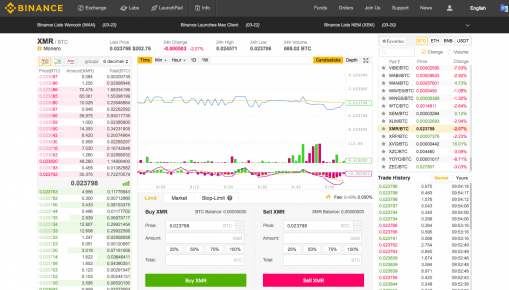 Binance is one of the newest major crypto exchanges around, having been launched in China as recently as July 2017. Despite being the new kid on the block, it has a fine crypto pedigree behind it: founders Changpeng Zhao and Yi He had worked previously at OKCoin exchange, while Changpeng had also been a member of the Blockchain.info wallet team since 2013. And even though it was launched only in July 2017, it became the largest in the world in terms of trading volume within six months. It remains near the top today, something which can be put down to its ease of use, its responsive ability to handle a large number of transactions, and its availability in English, French, German, (simplified and traditional) Chinese, Spanish, Russian, and Korean. It is a crypto-to-crypto trading platform only, so it’s not suitable for casual traders looking to buy some bitcoin or ethereum using US dollars or euros (it does offer USDT trades). Nonetheless, its impressively low fees make it one of the best for serious investors and speculators. Security at Binance is generally sound, but with a few potential worries. First, the good points: Binance enables users to enable two-factor authentication (2FA), with Google Authenticator and SMS authentication as the two methods of 2FA. It also has a fairly extensive security FAQ in its Support section, where it advises its users on how to guard against phishing attempts and personal security lapses. Despite the care it takes to advise users on best practices, Binance doesn’t make clear the security measures it’s taking behind the scenes to ensure that its platform remains secure as a whole. There’s no indication that it’s using cold (offline) storage of customer funds, and neither is there any indication that it’s backing up and encrypting its data, or even maintaining full reserves (à la Kraken, for instance). That said, recent events have shown that Binance can respond quickly to major threats, and protect customers funds. For example, in March 2018, criminals managed to use phishing to hack into the accounts of numerous users, whose funds were inexplicably sold off in order to purchase the viacoin (VIA) cryptocurrency. However, despite this, Binance was able to systematically identify and reverse all irregular trades, meaning that the only people to lose money were the hackers. 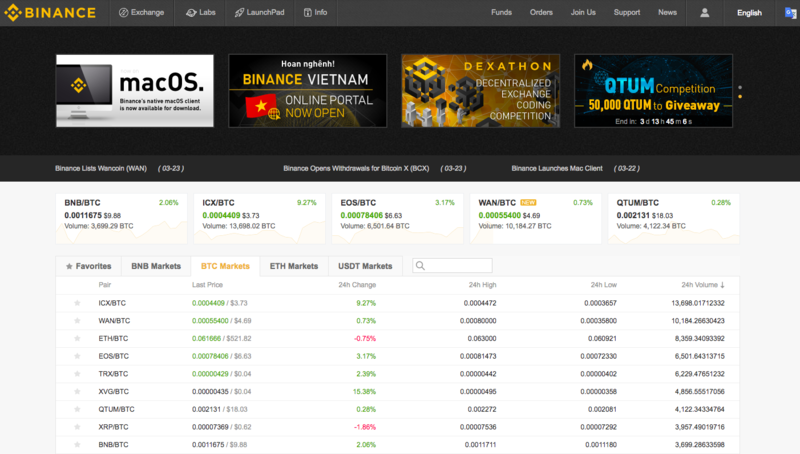 Usability is one of Binance’s key strengths. Its website and trading pages are easy to navigate and understand, with trading options and screens clearly laid out. 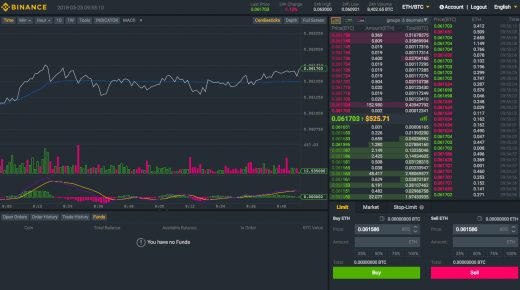 It even provides the option of moving between “Basic” and “Advanced” trading screens, so that more experienced traders can benefit from having more information (such as user funds) contained on a single page. Verification is also fairly straightforward and quick, with Binance responding promptly to the submission of verification documents. That said, taking a selfie while clearly holding up an ID document and a piece of paper with “Binance” and the date written on it is a very tricky maneuver. As for customer support, it should be noted that Binance doesn’t offer a phone number for customers to call with their queries. This can make Binance a little less responsive than other exchanges, and while their online support system is often quick, it can get bogged down a little during periods of peak demand. And finally, Binance scores extra usability points by virtue of the fact that it offers a mobile app for iOS and Android. Given that Binance offers only crypto-to-crypto trades, all deposits and withdrawals involve moving funds to and from external crypto wallets. Despite this limitation, deposits and withdrawals are a speedy process on Binance. 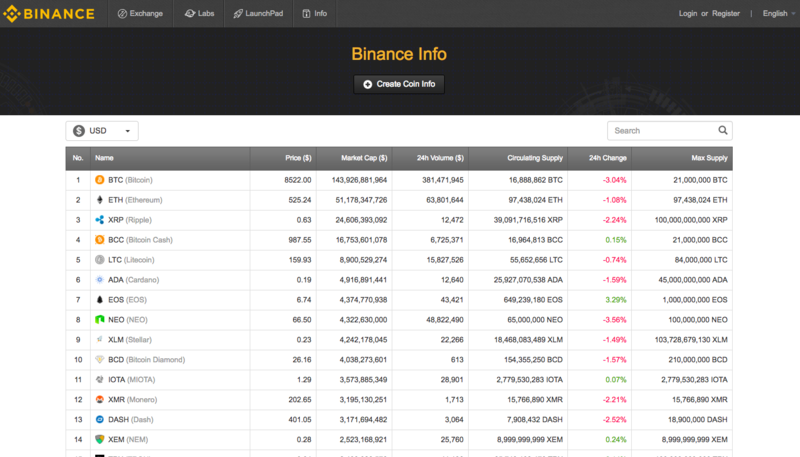 Customers hover over the “Funds” dropdown menu, click the “Deposits” option, for example, and then type in the desired cryptocurrency to receive a Binance wallet address into which they can deposit it.